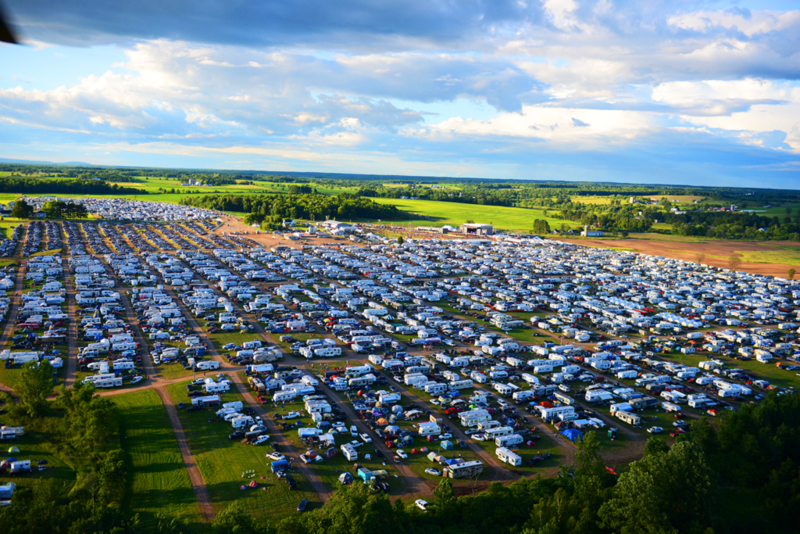 With just 20 days to Country Fest, we’re hoping Country Fest fans have begun planning their camping stay with us. 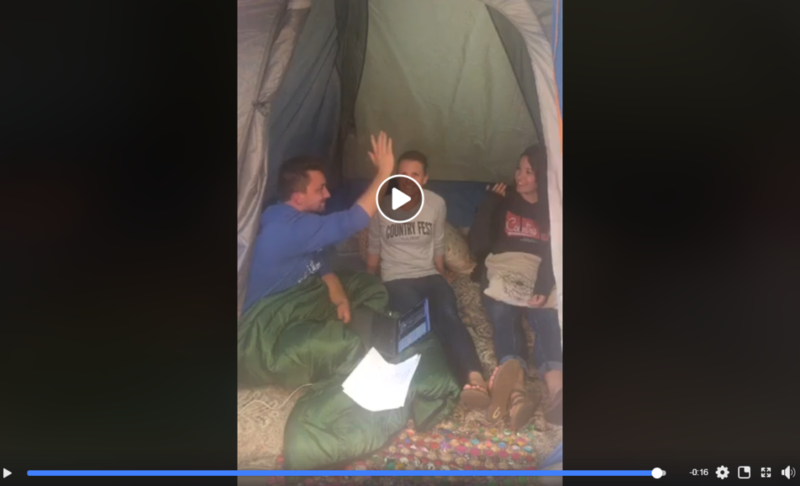 Country Fest staff went live on Facebook Wednesday, May 30, to answer your camping questions. Find these and our answers in the video & comments! There is an extensive list of Frequently Asked Questions about Country Fest and Camping, specifically. Visit our website to see a list of commonly-asked questions (a lot of these came up during the Facebook Live). You can find this same list on the Country Fest Mobile App. The FAQs are found in the “Learn & Connect” tab. Select “FAQ” from the lower right corner of the screen. 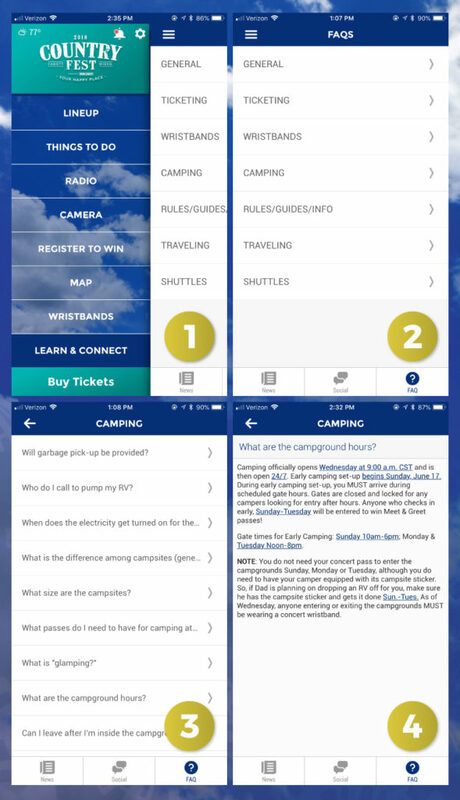 The Country Fest mobile app is full of information–waiting at your fingertips. If you haven’t yet downloaded the mobile app, it’s available to you for free! Check out this blog post for all the information you need. In the age of digital information, there are still important phone numbers you’ll appreciate having in advance. HINT: Add them to your contacts now! There’s still time to get your campsites for Country Fest 2018! We have a downloadable PDF guide for the essential of What you Need to Know at Country Fest! Download & print so you have it ahead of time! North and South Campgrounds have been sold out for some time (as well as Glamping! ), but you can still camp at Country Fest in our West Campgrounds. The West Campgrounds are just west (literally) of North Campgrounds, less than a quarter of a mile from the Concert Grounds. Insider Tip! Prices increase Saturday, June 2–get your campsites in the West Campgrounds before then! There’s so much information about camping at Country Fest, you won’t have a bad time. Be sure to have your campsite stickers with you as well as all the belongings you’ll need to stay with us. Be sure to refer to our FAQs & all the info on our Country Fest Mobile App if you have questions. Of course, you can contact us on any of our social media platforms or via email. We’re so excited for Country Fest 2018!